This 1968 Mustang notchback/coupe was built out of a clean, undamaged core car that had spent it's early life in Northern California. 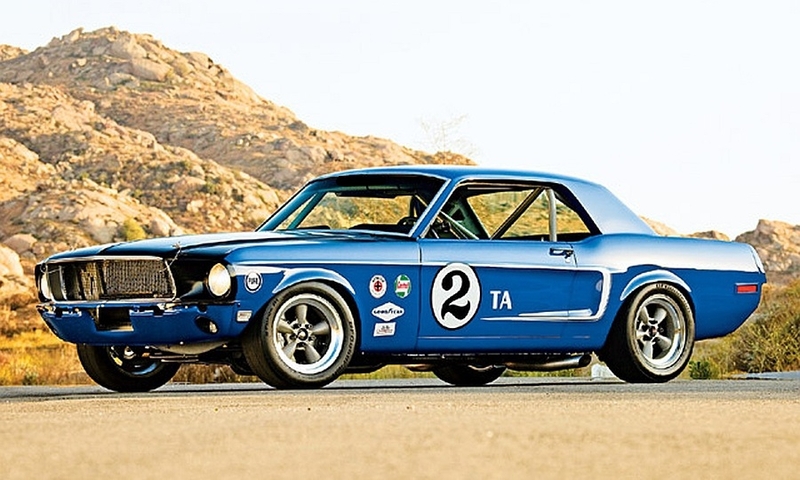 This Mustang was built to be road-race ready, yet street legal. A professionally modified chassis, suspension and brakes, motivated by a modern drivetrain were all carefully massaged to present an aesthetic of an early Trans-Am racer. The sheetmetal contains radiused and rolled wheelwells, a full rollcage, a fuel cell, a fully gated and baffled oil pan, and many other items normally only implemented on full race cars... but again, incorporated in such a way that the car could still be used on the street. Even the paint color used on this car was custom mixed off a piece of an original ’69 Shelby Dan Gurney Shelby team car, to really help cement the "period-correct" look this car maintains. A Ford Motorsports 302-crate engine with GT40X heads and an upgraded X303 cam give this 1968 Mustang 360 hp and 340 lb-ft of torque. An Edelbrock Performer RPM Air Gap intake and a Tony Oddo modified Holley 600 carburetor provide the aspiration. The power is transmitted through a Super-Duty, World Class T5 transmission and a Ford 9-inch rear housing a set of 3.89:1 gears and a Detroit Locker differential. This car also uses a set of fully rollerized upper and lower control arms and spring perches that allow the suspension to fully articulate without deflection, and the shocks and springs handle the movement and damping without bind. For the street the car runs a set of BFGoodrich g-Force R1 245/45R16 tires mounted on 16×8 wheels. For the track, the car has a set of 15x8 Torq-Thrust "D" wheels that utilize period-correct Goodyear "Sports Car Special" racing tires.